Paolo Buffa Midcentury Blue Velvet and Wood Italian Dining Chairs, 1950 A fine set of six Italian midcentury dining chairs with original blue velvet upholstery in a very good vintage condition. Elegant design by Paolo Buffa, 1950. This stunning and impressive Italian executive desk with finished brass sabots, provided with seven drawers. Arch. 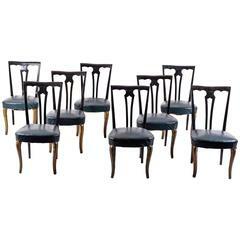 Paolo Buffa set of six dining chairs. Wood and original double-sided wicker. 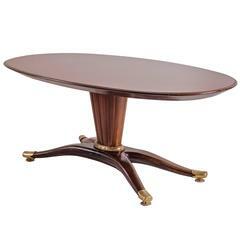 Made from mahogany and upholstery covered in velvet. In good condition. Measures: Width 53 cm Depth 44 cm Height 96 cm Seat height 55 cm.